The extra oil is flowing into storage tanks, which could reach their operational limits, known as “tank tops” as early as mid-April. Right now oil supplies are at their highest point in the last 80 years, according a Department of Energy report released last week. "The fact of the matter is we are running out of storage capacity in the U.S.," Ed Morse, head of commodities research at Citibank, recently told the Council on Foreign Relations in New York. Morse said oil prices could drop from the current $50 a barrel all the way down to $20 per barrel, which would prompt oil companies to stop production and gas prices to fall even further. Analysts give several reasons why oil continues to fill US storage facilities. Despite falling prices for crude, oil production domestically continues to rise. While companies are cutting back on drilling, that won’t affect a reduction in supplies until later this year, the Associated Press reported. Much of the new oil produced is known as sweet crude, which many US refineries are not designed to process, and under federal law they can’t export it. Meanwhile, foreign oil is still arriving in the U.S., because of economic weakness in other countries and to feed refineries designed to process heavy, sour crude, according to the AP. Late winter is the slowest time of the year for gasoline demand, so refiners typically reduce production, which means supplies build up. 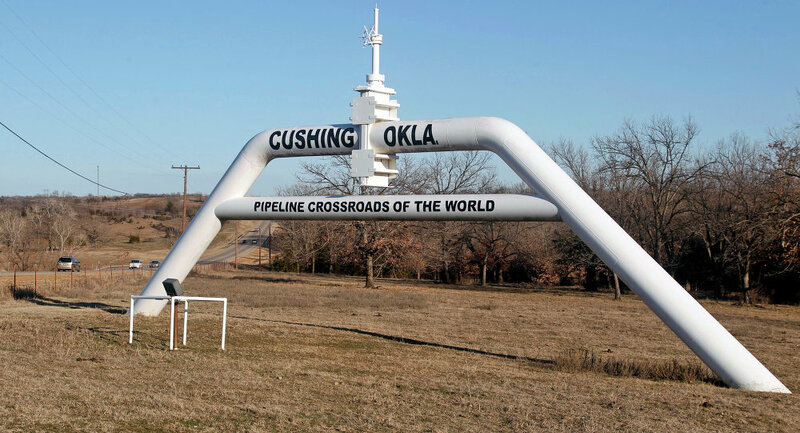 Most of the oil traded in the US ends up at the delivery point in Cushing, Oklahoma, which has enough tanks to hold up to 85 million barrels of oil. Genscape, a market data firm that surveys Cushing to check storage levels, estimates Cushing is two-thirds full. Supplies are increasing at "the highest rate we have ever seen at Cushing," Genescape pipeline and storage manager Hilary Stevenson told the AP. New storage facilities are currently under construction there, and other large facilities in Texas and Louisiana are expected to take on some of the load once gas prices drop enough to make transport feasible. While the Department of Energy reported a rise in crude stocks last week, it was also reported that diesel and gasoline fell more than expected. That has led some analysts to speculate that demand for crude will soon pick up, while others believe it will take the summer spike in drivers to make a difference.